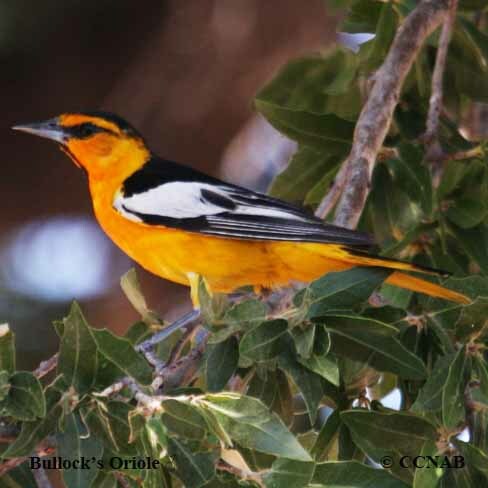 Species: The Bullock's Oriole (Icterus bullockii) is the second sub-species member of the Northern Oriole. Found in the central USA northern states and up into south-western Canada. 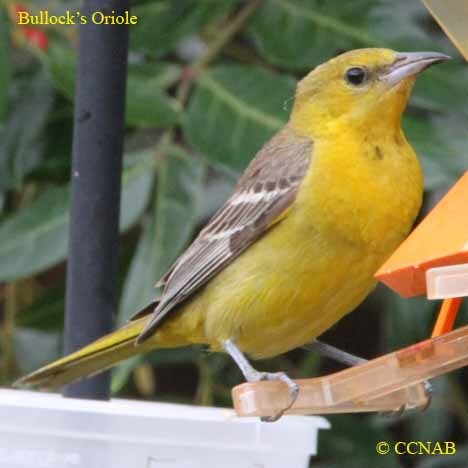 As like other orioles, the Bullock's Oriole woves its nest into the shape of hanging baskets. 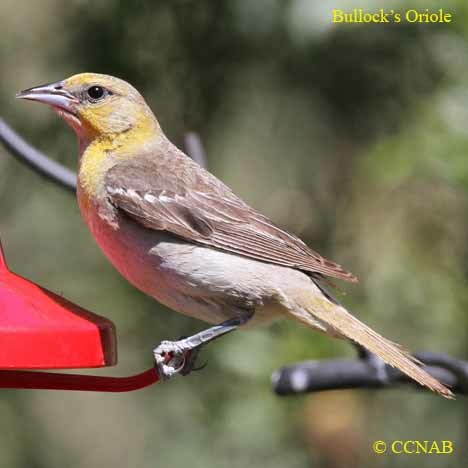 These birds are attracted to bird feeder, enticing them with fruits, jellies and nectars type juices. 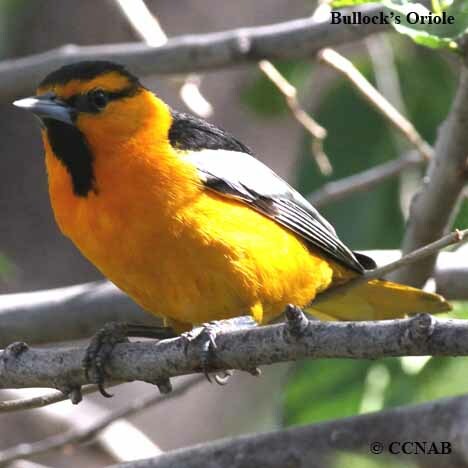 Distinctions: Sexually dimorphic, the male has a black crown and eye line, black wings and tail feathers, large area of white coverts on wings, strong orange supercilium, back and body. The female has a light orange body, yellowish supercilium and whitish flanks and under body, some white wing edging, black wings. Juveniles appear more like the females, maybe slightly brown coloured wings. 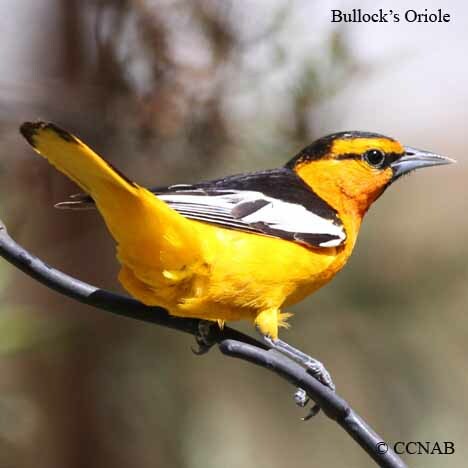 Voice: Musical whistles, some similarity to the Northern Oriole. Nesting: Four to five whitish to whitish-grey eggs, with squiggles of brown and black lines. Nest built from grass, plant fibre, tree bark and string, woven into the shape of a basket, attached to branches high up in the crown of trees. Distribution: Commonly, found throughout wooded areas with mature trees, usually near water. Is an attractive bird, visits backyard bird feeders. Seen in North Dakota to southern British Columbia, down into California, and across to Texas, and into Mexico. 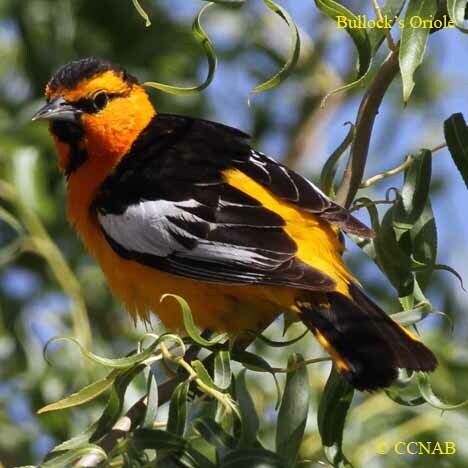 Migrates into Central and South America in the non-breeding season.